Home > Advertising, Design, Graphics & Illustration, Things I Like...	> Underground Guerrilla Signs..
Reblogged this on The Happy Land of Absolutes. That’s excellent… I’ve been keeping my eyes open, but so far I havn’t been lucky enought to spot any… maybe one day soon.. I may even have to make some of my own..
check out our stickers for TopHat and Ginger. we’ve had them about a year. it could have been us that started the whole thing. 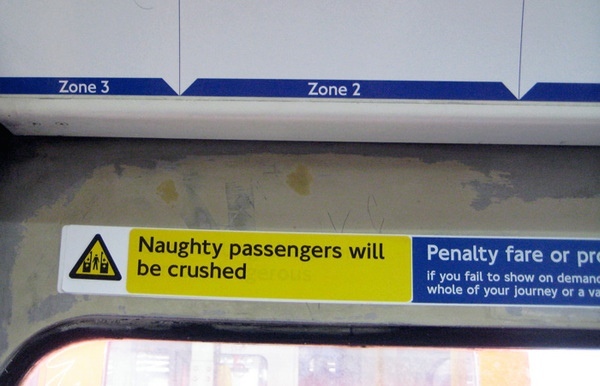 Stickers On The Central Line. Excellent link, thanks there’s some really good ones in there.. I’m still looking for my first one.. It hasn’t. Right now killjoy jobsworths will be going around removing them in case someone laughs and upsets the very balance of the universe. These are delightful! We’ll look out for them when we’re next on the tube.they qualify for one of my beautiful things , something that pleases me! Oh wow this is excellent! I must say I do study signs and everything on my journeys on the trains but haven’t had the good fortune to come across any of these as yet. I blogged about the “everyday visual clutter” and myriad of messages during the Olympics. 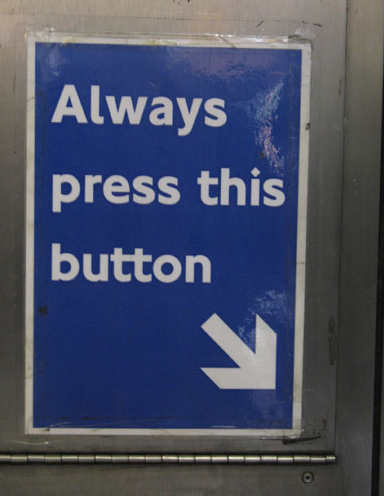 I always wonder why Transport for London feels so insecure it has to try to brainwash us into submission…but then, I suppose these signs say it all! Reminds me of the old Graffiti classics from the 70’s. My fave back then was on a Reed Employment Agency poster that advertised “Accounting For Women”, to which a genius had appended, “There’s no accounting for women”. Ha Robert that is brilliant. My favourite was a slogan on a roundabout in Harrow that read Nicholas Parsons is the neo-opiate for the people. I used to go pass it on my way to school. I had to ask my Dad what it meant! Haha these are brilliant! 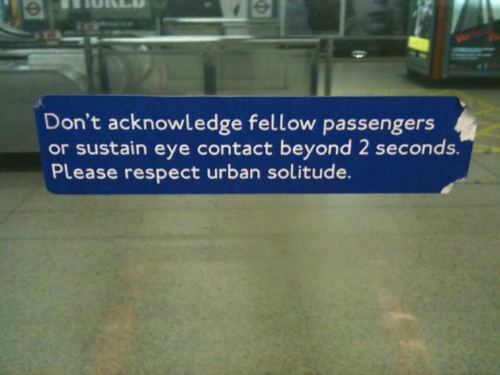 I especially love the ‘Don’t acknowledge fellow passengers…’ one! I am not a Londoner and had no idea there was such an unwritten rule… until I found myself on a broken down tube one day and attempted to chat to a fellow passenger, who replied politely, but was hardly keen to get into a conversation (even moving away down the carriage, meaning that the attempted conversation was over rather abruptly)! Later that day I told a friend (a Londoner) about this and she said “Oh no, you mustn’t speak to people on the tube! !” I was like, “Why on earth not? !” (There was nothing else to do when the train broke down and we could’ve been stuck for a very long time, so it made sense to me to try to befriend someone). That evening she and I were both travelling on a different tube and I had to laugh when a rather inebriated fellow passenger started a rant about “Why is that noone ever talks to each other on the tube?? !” Classic! I’m not a Londoner either, although I spent a fair amount of time there as a teenager but I have to say I never found it that strange that no one was talking to each other. However I was a Games Maker during the Paralympics this summer and there were countless times I was engaged in conversation, I have to say mostly by people who were not Londoners themselves, but I do think the uniform played some part in getting people talking. Fellow Games Makers during that last week often mentioned that it was weird and maybe slightly sad that come the Monday life would just go back to normal. I was on the underground the day after the Paralympic closing ceremony and it had done exactly that. Very envious (esp. as its a good one) I’m still looking and hoping..
Have these been done by a rogue 3rd party or something? 12 monkeys? Fantastic. I saw the sitting on people’s laps one about 5 years ago, love that there’s more now! These are so brilliantly done I had to reblog it! Wish I had spotted one of these. What a little genius this person is. Is this the london equivalent of yarn bombing up here? I’m popping down to London soon. This would make my day! I once made a mandatory sign (blue background white letters) for a construction site I ran “NO TRACKY BOTTOMS ON SITE SMART ATTIRE ONLY) !!! These are great. Remember travelling to east London (Rotherhithe from Baker Street about 18 years and 3 months ago) and this eastender fella, started a social commentary, He was one of the funniest men I have ever listened to (not on telly or paid for or the right wing kn*bs at the pub). I really wish I could remember the funny things he said but I can’t ( coz I am not funny like that). Sometimes he was rude to people, but only slightly slating them, for sneering at his ability to break out from the mould and actually talk to people he didnt know. He was a genious, like the guy/gal priniting these little ‘ditties’ ….brilliant, ….lovely! 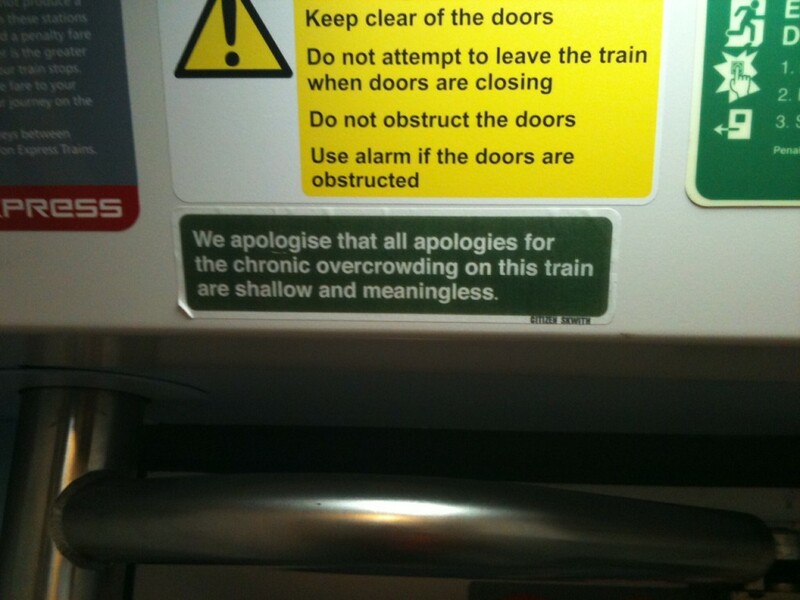 One day they will get spotted for the little gift they gave to London commuters. 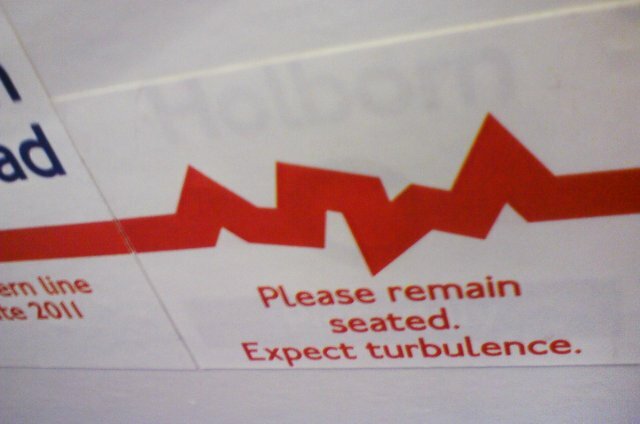 Just been sent a link to this webpage with some fantastic guerilla stickers on the Underground. Had to reblog…. Sorry it’s been a while here. I was directed to this by a friend living in London. These are absolutely brilliant. — The Mgt. Marcus Cheney. I’d have a problem not talking on the Tube – as a southern American I talk to everyone, even if I’ve only known them a few seconds. I absolutely love this post and add it to another of the long list of reasons I want to visit London someday. Congratulations on being Freshly Pressed. 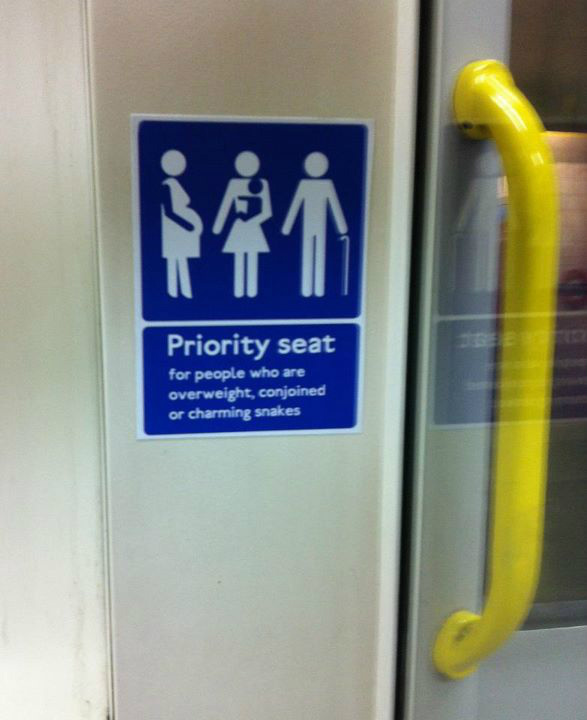 Saw this a few weeks back and it made me wish I’d paid more attention on tube trains during the Paralympics. 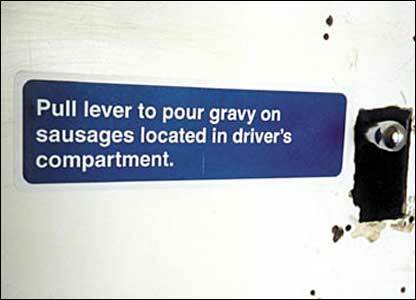 Gravy & sausages, shepherd’s pie – this is clearly the work of a Northerner or possibly a bandit outfit thereof! Hilarious post !! Are these signboards for real? Sometimes I wonder whether these are prank signs, put in the wrong location, a typo, from another country, or someone simply messed up. These are fantastic! I was laughing through the whole post 😀 Thanks for sharing and congrats on being freshly pressed! Ah, so that’s why I always read the signs! Thanks for the laugh. These are awesome! Just proves that creative minds can only be happy temporarily until it becomes necessary to instigate fun and mischief! Love this! There should definitely be “love” button. That would have made riding on the underground a bit more exciting. Too bad I couldn’t stand London any longer and have moved away already. Why couldn’t you stand London? I don’t understand.. I LOVE London, it’s the best place in the world.. This is classic! Love it, thanks for sharing. And who says everyone in London is too serious and prim? too too funny!! Brilliant signage .. some very clever artistic people out there! I loved this post!!! you are actually amazing!!!!! 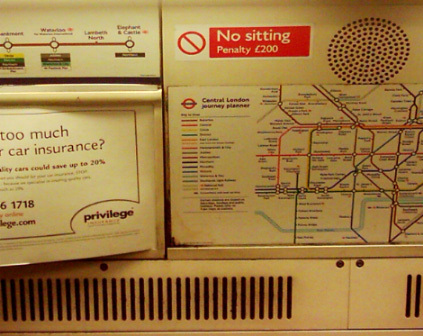 While I finish the post about my trip to Munich and the Oktoberfest, read this fun blog post from Joe Blogs on some guerrilla signs that have been appearing on the tube and on social media lately. Whoever said that using the tube is not entertaining! I laughed out loud at the sausage sign. Absolutely brilliant work, whomever has taken the time to create these. This is fantastic work- we have seen a few of these signs and were very confused for a while also- indeed if That London has left you bemused you might do well to take a look at our blog. 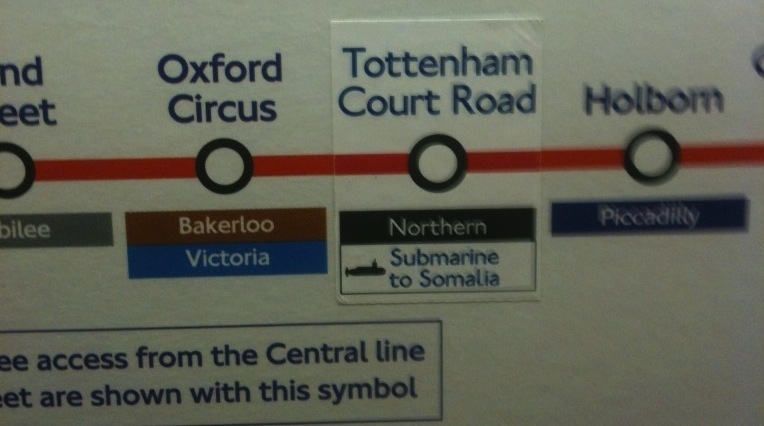 “Submarine to Somalia.” 😆 How I love our British sense of humour! Awesome, tell it like it is…truth is funnier than fiction. England’s SON’S OF LIBERTY and some well needed “Civil Disobiedience”…GREAT JOB HOMMIES!! HAIL TO THE QUEEN, BEBE, lmfao. Ya’ll really do “Keep Up Appearences”. Where’s the “love” button? Congrats on the well-deserved FP! Also: Shared with my 2100 friends on Facebook. Thank you! Very nicely done, Sir Joe. These are pretty funny. There is nothing like the British sense of humour. Another thing to keep your eyes out for in London: http://www.nytimes.com/2011/06/14/world/europe/14muswell.html. The gum art is really cool if you know where to find it. 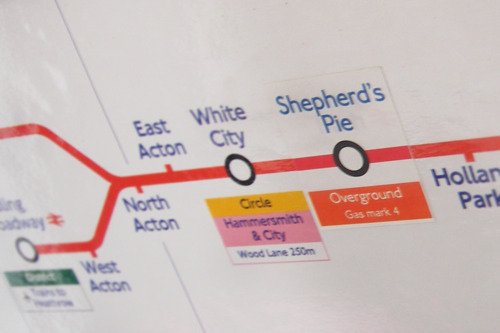 hey these are brilliant, I often travel on the Tube and have never come across one (doesn’t help that I am half-asleep all the time…) – can’t imagine what some tourists make of them, when they take out their dictionaries to translate them….. This is great! I need look out for these! I like to do what I call whiteboard bombing. When people leave drawings and notes on a whiteboard, I will stealthily add little bits and pieces to it which seem to make sense but utterly do not. I’ll have to get a picture of one and post it 🙂 This is taking the game way beyond my little shenanigans. So far beyond that it is quite amazing. How come I never see that stuff here in SoCal? I guess thats what happens when you dont ride public trans. You end up missing out. Haha, I love this! Great idea and great post! 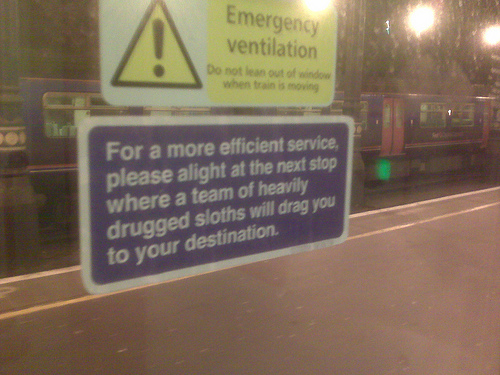 Oh man, we need these on the TTC here in Toronto. Brilliant! Oh to live in Great Britain! This one made me laugh…a lot. I remember finding the odd sign here and there and only thinking once to take a photo – I would share it but apparently the computer says, ‘No!’ Seriously, congrats on getting freshly pressed! I think I saw one on dancing in the train, but I didn’t have a chance to take a picture. I love them! Mass transit: the true story. Love it! This is brilliant and fantastic! Very interesting to read. Congratulations for getting into Freshly Pressed! first time freshly pressed for me.. the challenge is writing another one that catches peoples imagination.. Brilliant, absolutely brilliant ;and I’m pushing 62 but still an anarchist. It’s a pity this is almost certainly this is considered illegal vandalism, because these signs are actually pretty funny and often contain a few home truths as well! I wish for this one to be added: All passengers in the rear move to front ,,all in front move to rear, all in middle take three laps around the car and return to a seat one to the left of the one you are presently in. Very amusing! The built environment of almost every western city – excluding Gaudi’s Barcelona – is mostly dull, predictable, lacking in aesthetics and devoid of the beauty of nature, so anything that we can do to subvert these norms is to be applauded. Clever and accurate wherever you are. Maybe I should make some for the commuter bus I ride, such as: Please leave all needs for personal space in your car. There will be little personal space on the bus. Absolute genius. It’s the subtlety of the signs which just make it all the more funnier. Isn’t it lovely, here we are all sharing a laugh and there are no dissenting voices and nobody needing to use abusive language. Thanks everyone, subversives and bloggers alike. fact that we all still have a sense of humour in this world of political correctness! I lived in London a few years and think back to the Underground with some nostalgia. This had me litterally in tears. Thank you! Reblogged this on Sparkstone -Multichannel retail software. Just hilarious, if just one of these causes one morose and socially inept Londoner to actually turn and have a conversation with a fellow commuter then their excellent efforts will have been rewarded! and found that it is truly informative. I’m gonna watch out for brussels. I’ll appreciate if you continue this in future. Can anybody update us on the 2014 status of this ‘campaign’. Was it a fleeting fad? Also see: the Department of Social Scrutiny. I borrowed these images from several sources, yours being from The Poke. Thanks Joe! That’s super good of you, I appreciate that much. Well done on the hits, I think the combination of the Olympics definitely had a knock on effect on the Tweet that originally re-purposed the image. Can’t Spell Nemesis Without… « What's up at Ravens March. A Renaissance Masterclass… Single Hauz..